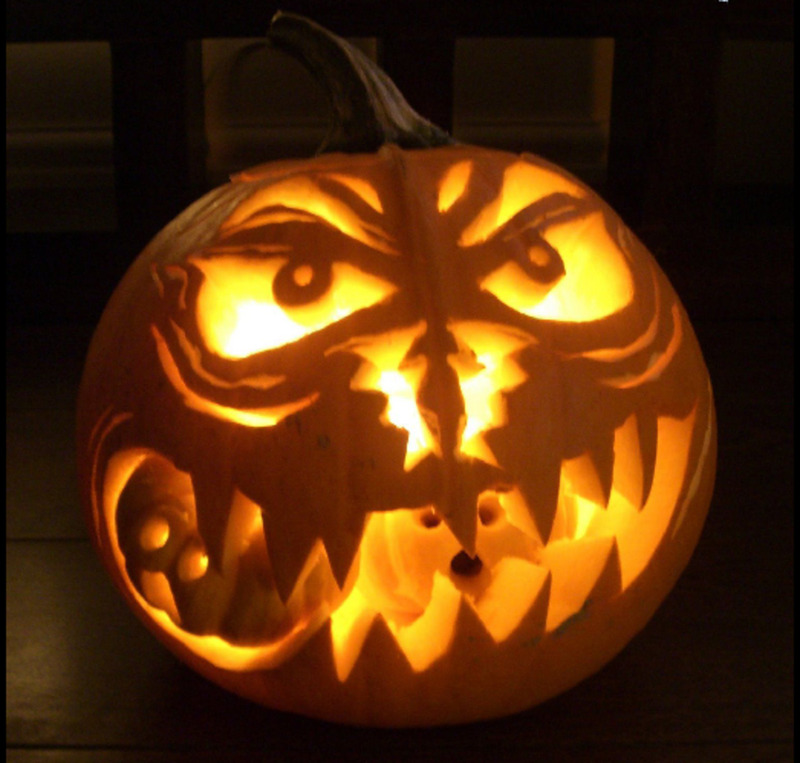 Find the best pumpkin carving ideas and patterns for Halloween 2015 on this page. 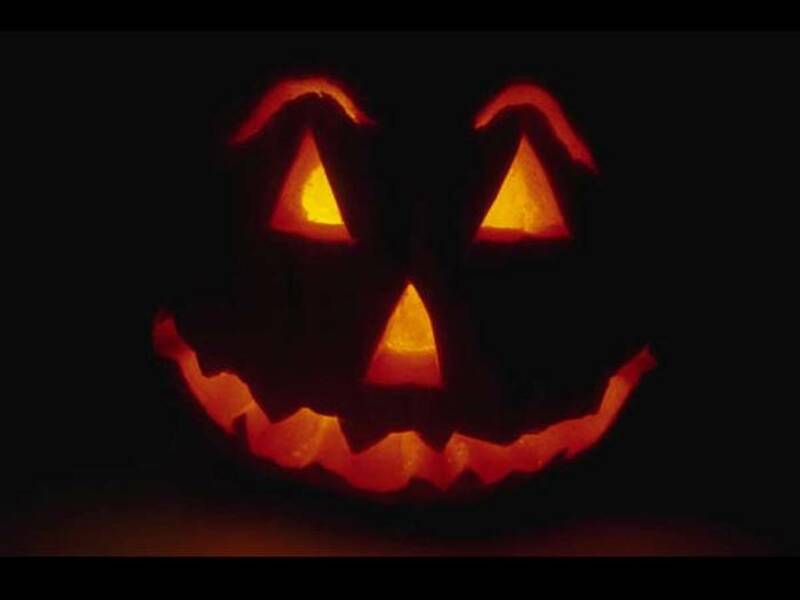 Here you will find big photos of pumpkin faces, jack-o'-lantern patterns and a how-to video guide. 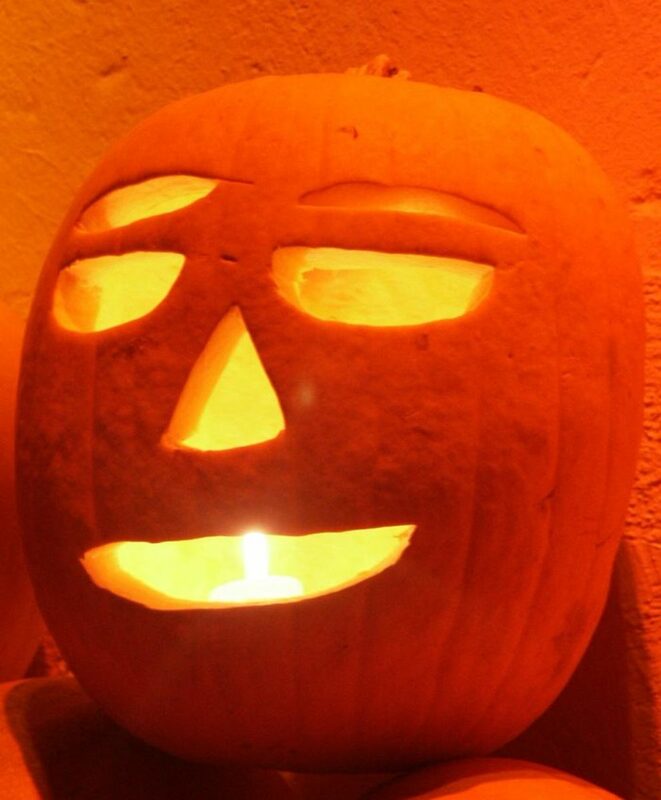 This giant pumpkin face was carved by a child. 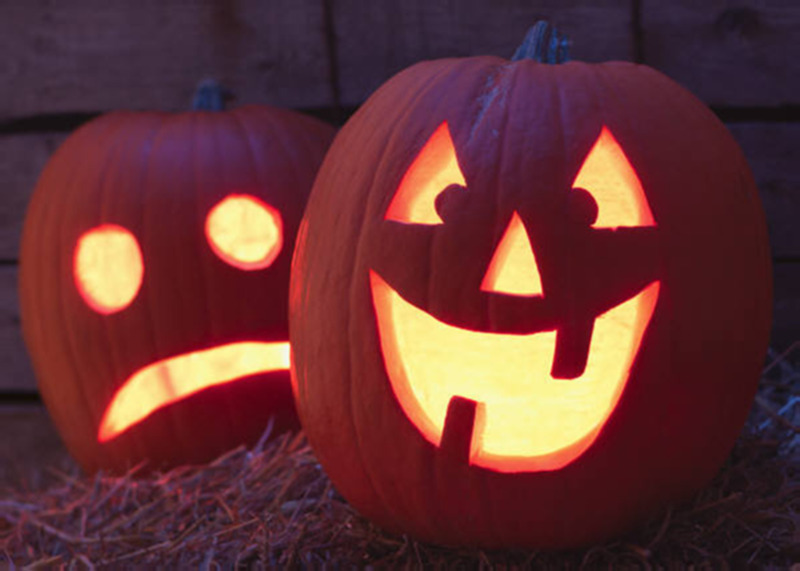 A good rule of thumb for helping young kids carve a pumpkin is: The smaller the child doing the carving, the bigger the pumpkin you should use. Mistakes can be easily corrected when there is more room in which to maneuver the carving tool. 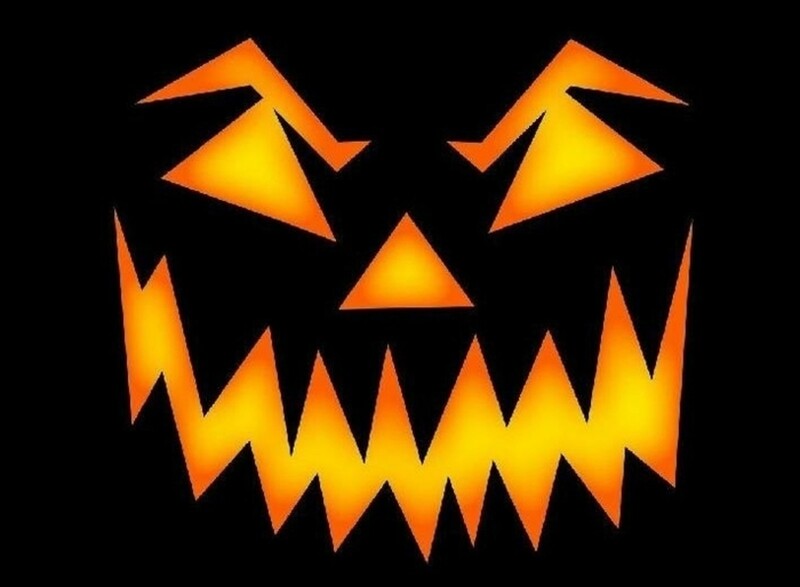 The pumpkin face below is made entirely of triangles. It's like a geometry lesson on a pumpkin. The template below uses half moon shapes for the eyes and the mouth. The added eyebrows give a happy-face look. 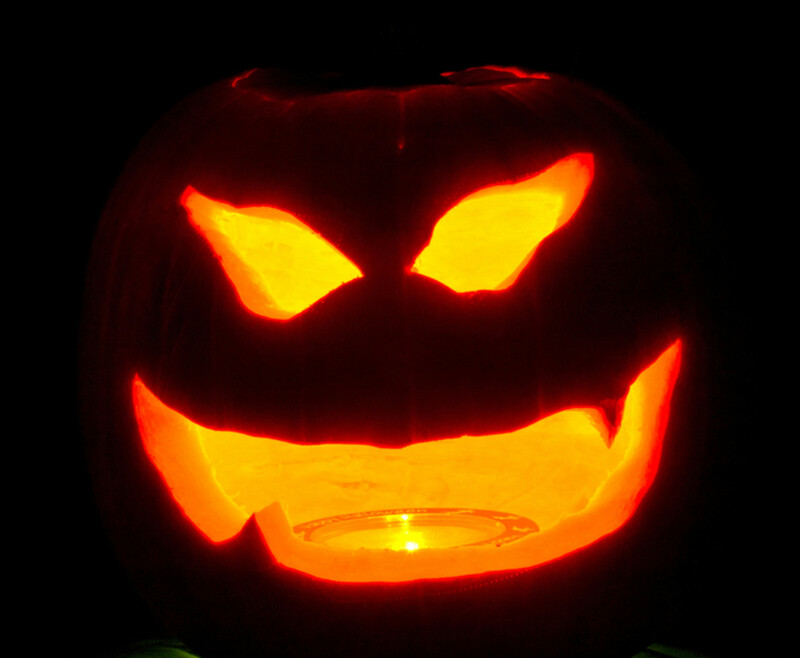 The picture below is the classic, life-of -the-party, jack-o'-lantern pattern. 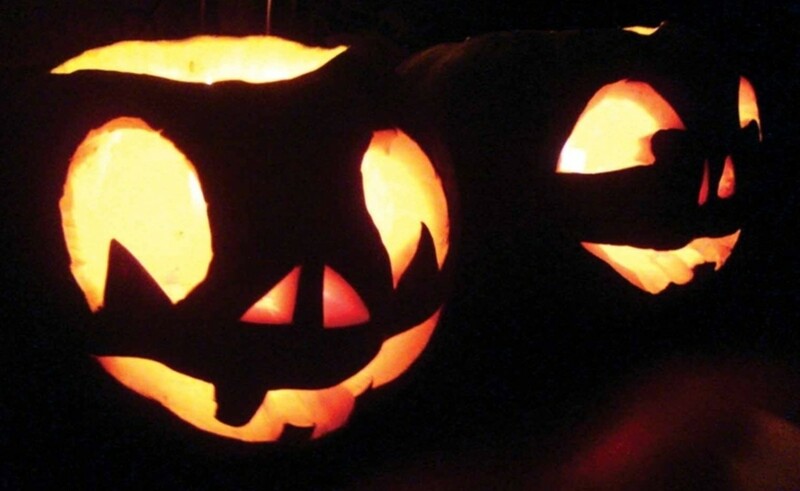 The one above also features a creative pumpkin carving idea. 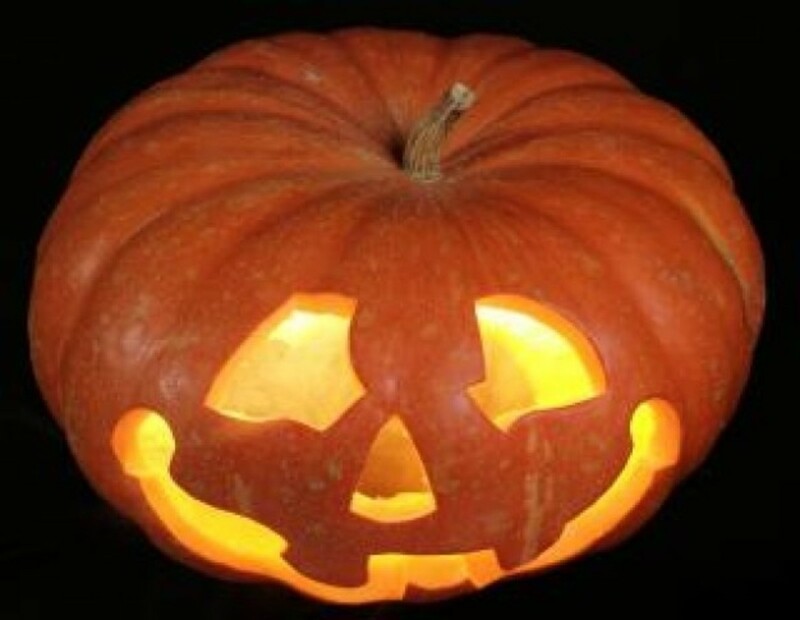 The carver cut the hole to remove the pulp and seeds in the bottom of the pumpkin instead of the top. 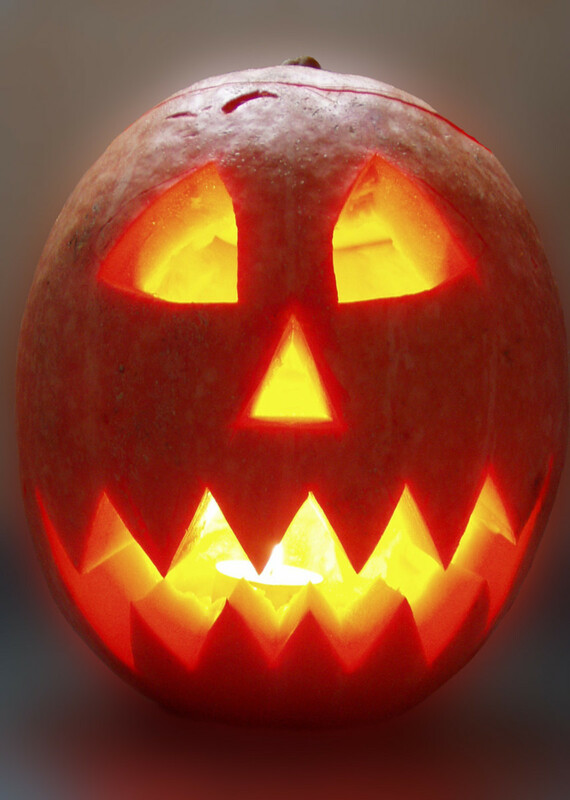 If you do this, the pumpkin can be leveled and will be less likely to tip over with a burning candle inside. Besides that, it does give a more eerie look! In the picture above, notice that a hole was cut in the top which gives the appearance of fire coming out of the top of its head. 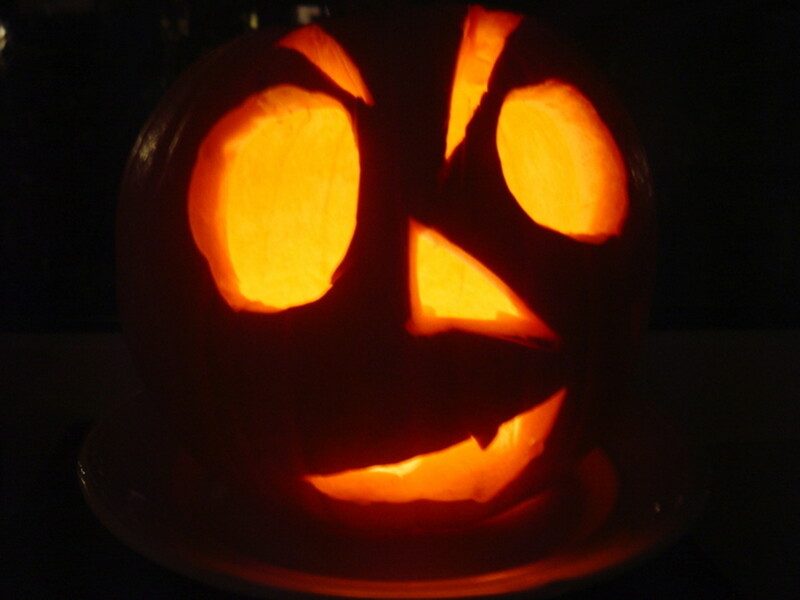 The eyes and mouth of the scary pumpkin carving above are outlined with a red felt-tipped marker for added effect. Notice the triangle cutouts for the pupils of the eyes. 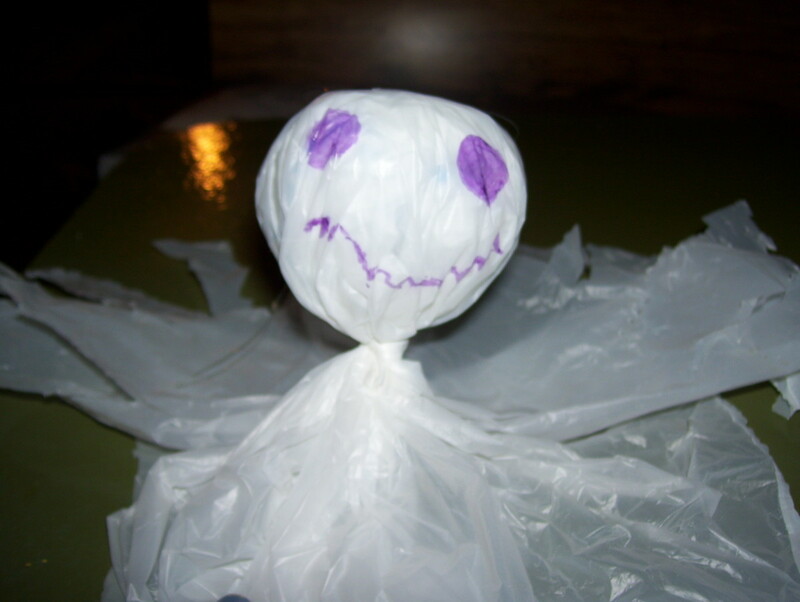 Ghosts are also prominently featured on Halloween. The design below uses a template from the famous Edvard Munch painting The Scream to make a creepy, glow-in-the-dark ghost. 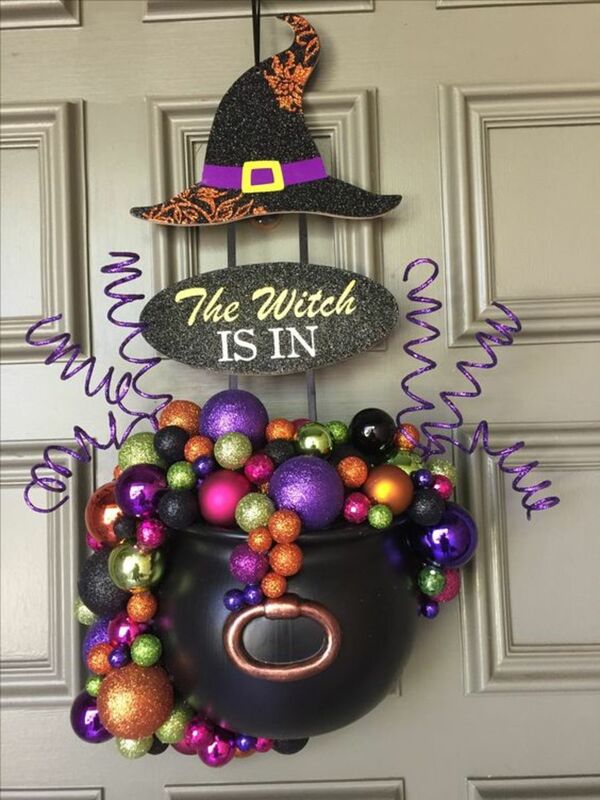 This idea is perfect for a haunted house theme. 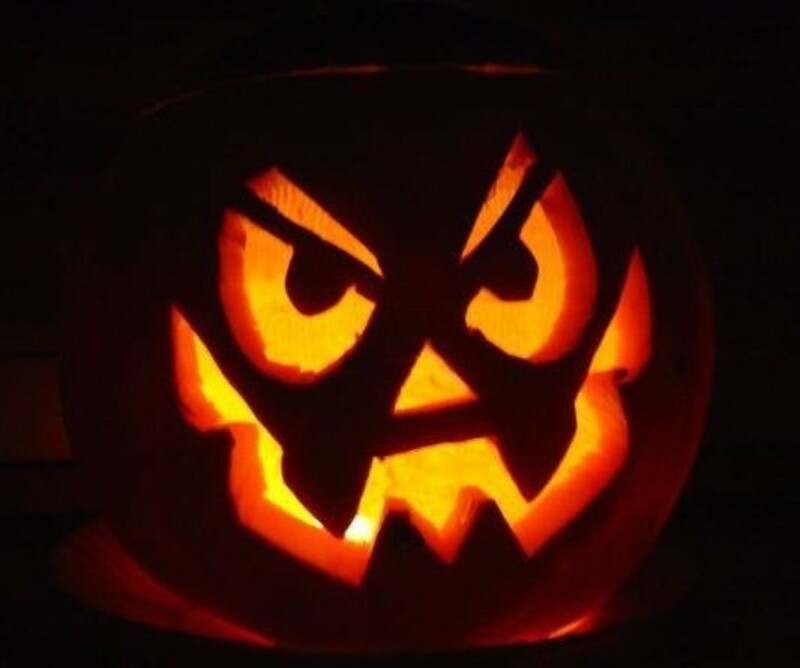 Use the idea below to make a pattern for a mean pumpkin man. Notice how the angry eyebrows are made. For a really creepy effect, just carve the eyes and no other facial features. 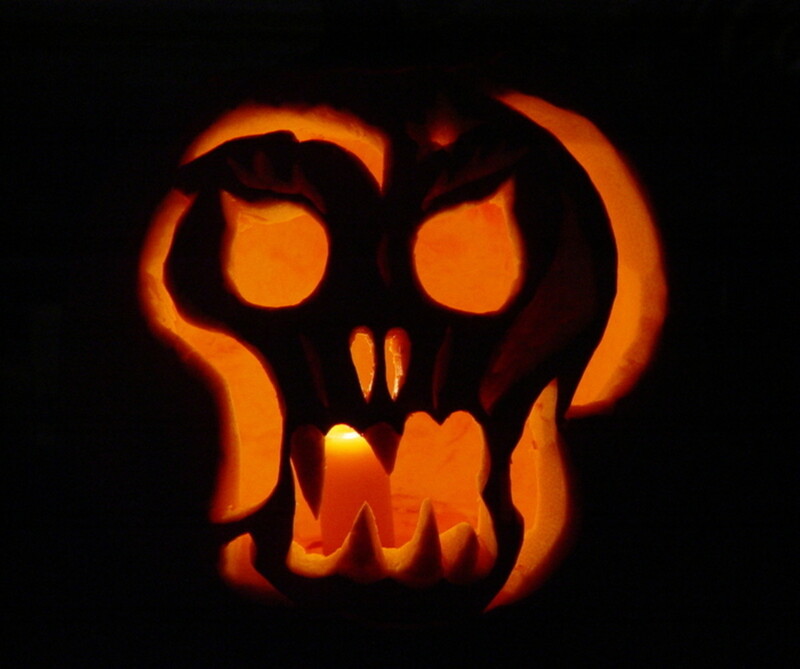 When you do this, your carving looks like a Halloween cat lurking in the night. 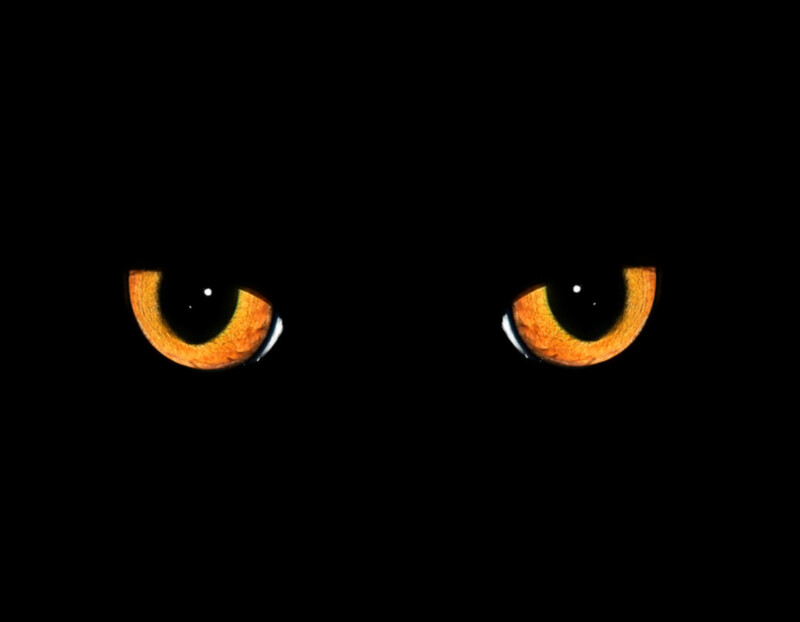 It wouldn't be Halloween without a black cat lurking in the darkness. You can easily add one to a pumpkin. First, select one of these great pictures of Halloween cats. Next, make a pattern by tracing the one you like to thick black paper, using colored carbon paper to make the transfer. 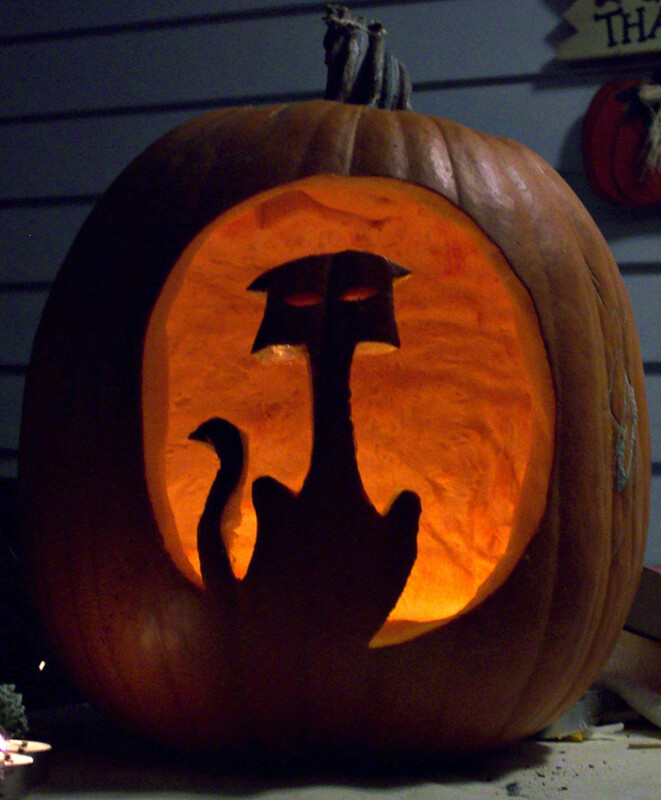 Cut out your black cat and use a glue stick to attach aluminum foil to the back to protect it from the candle flame. 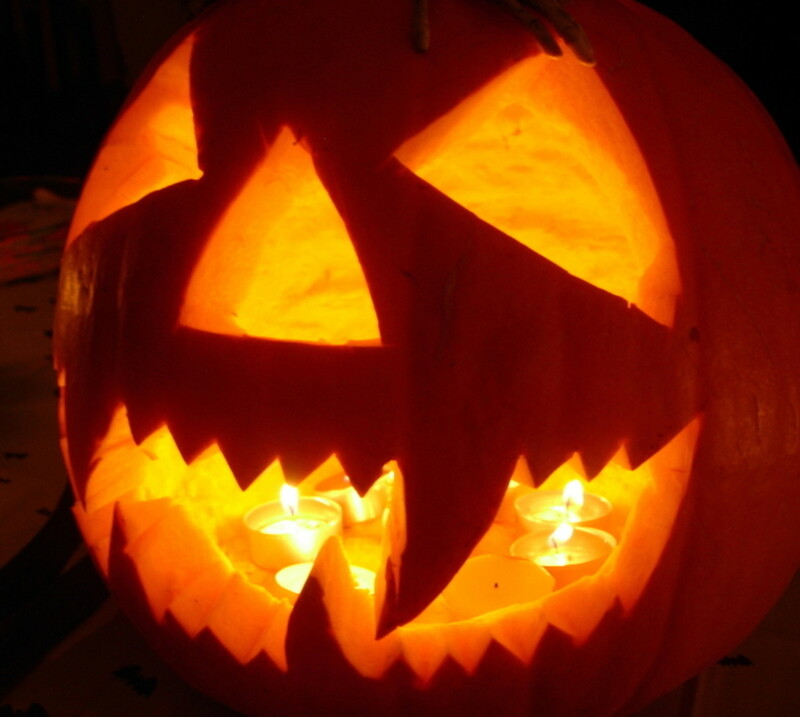 Then, tape toothpicks or kabob skewers to the back and insert into your pumpkin. This is a unique idea and a real show-stopper. Here's two carving examples which resemble the Felix the Cat cartoon character. A red felt-tipped marker adds the finishing touches. 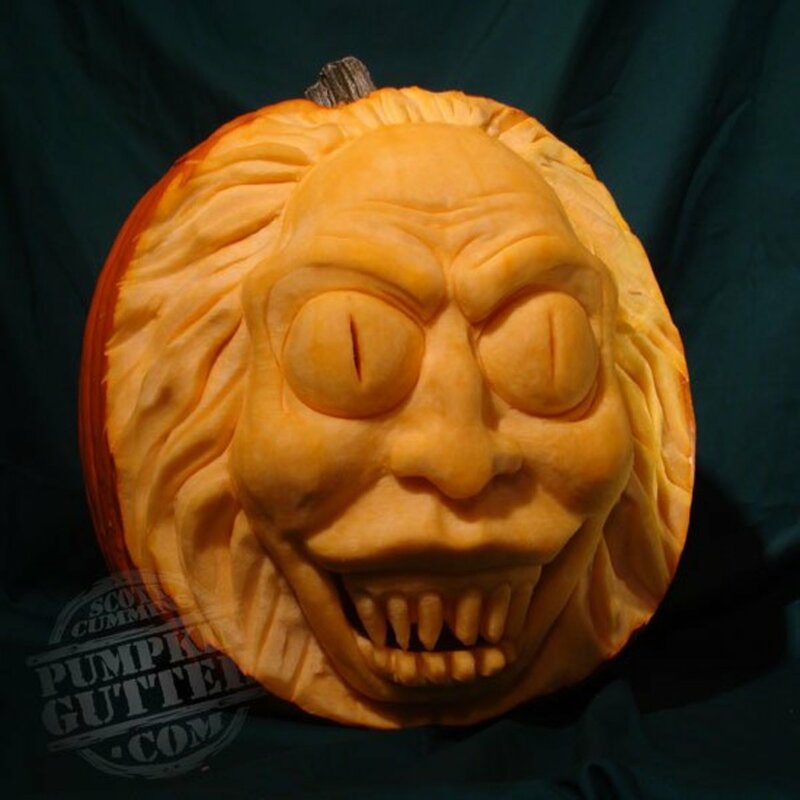 These are extreme creations from the guru of pumpkin carving, Tom Nordone. 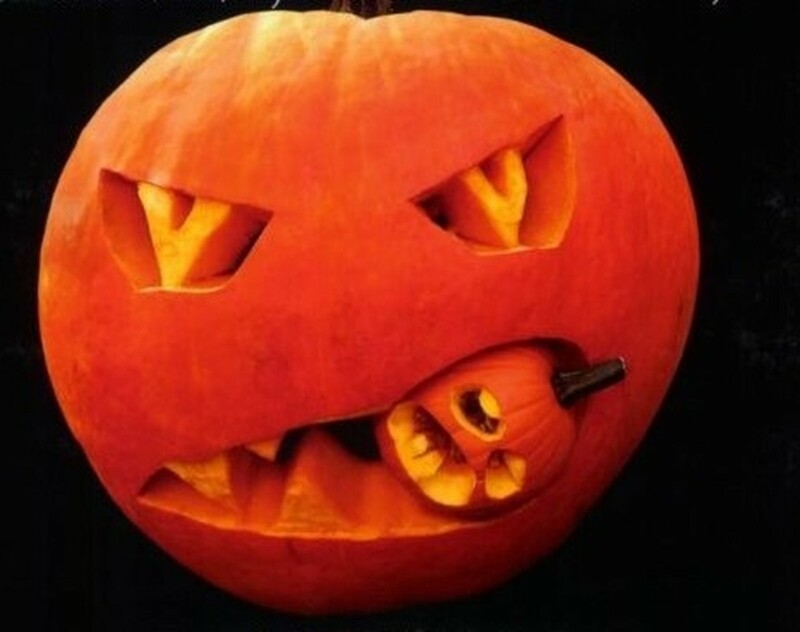 Check out this cannibal pumpkin man. 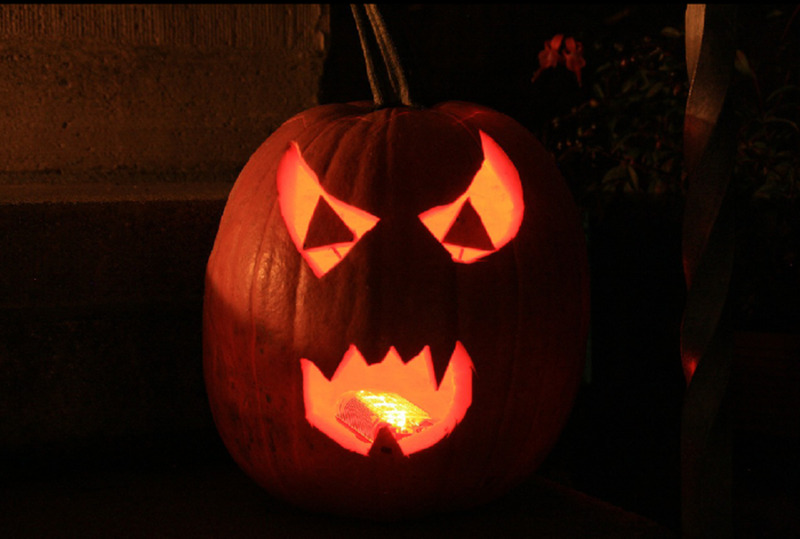 This guide is written by pumpkin-carving addict Tom Nardone and he gets his 15 seconds of fame every year at Halloween. Click to go look inside this book for even more great ideas. 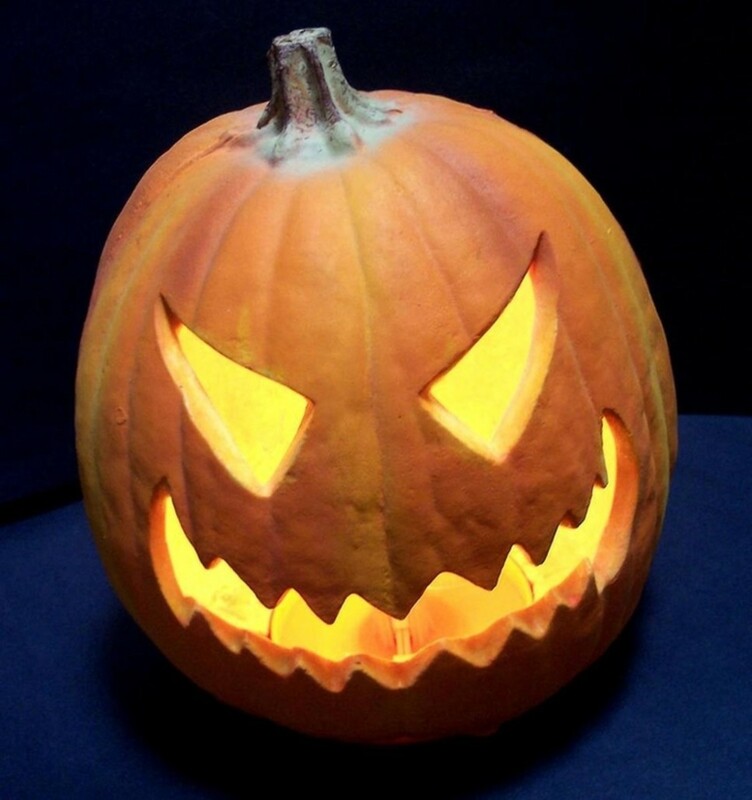 Learn the tricks of carving your pumpkin from the world's #1 expert in this video. Watch as Tom Nardone explains his methods and shows you which tools to use for special effects. Most of the carving tools he suggests are found in your kitchen drawer or at your local hardware store. 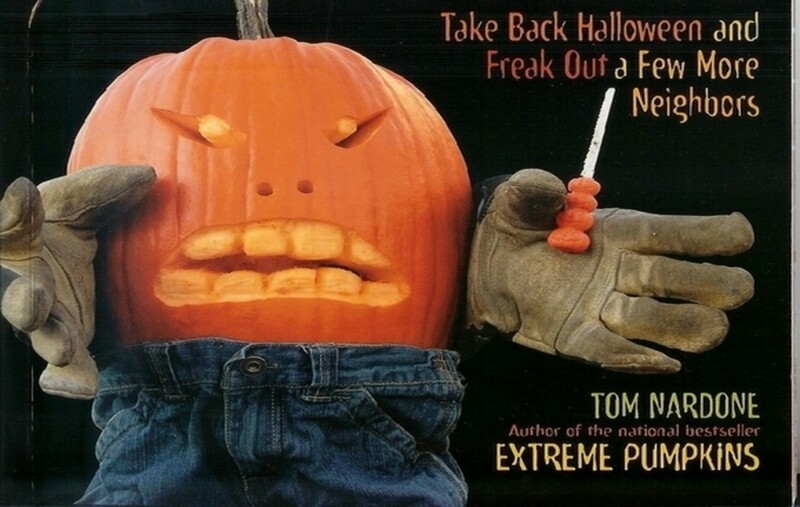 This is the sequel to Nardone's first book and this is the ultimate extreme pumpkin carving guide. Click to look inside book. 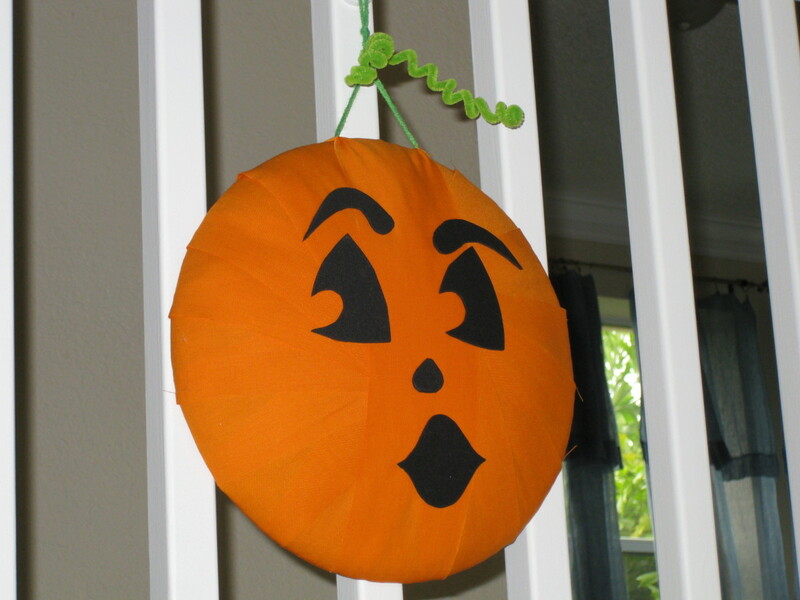 Making these pumpkin faces for Halloween jack-o'-lanterns is a super family activity. Don't have kids? 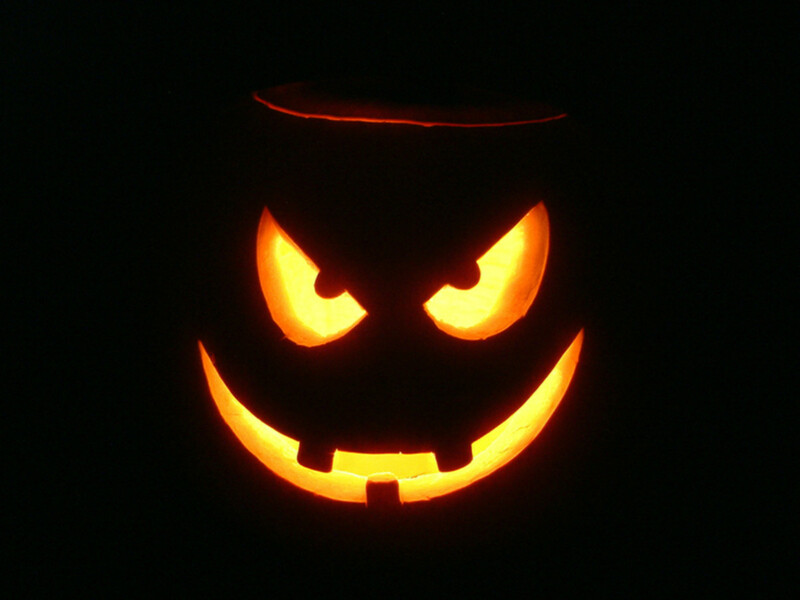 Invite your friends and neighbors for a pre-Halloween party and make pumpkin carving the evening's entertainment. It's a great way to collect a creative assortment for your holiday decorating in a short time. Enjoy! @ easylearningweb - Thank you and I hope you can put these to good use. @ Mary (Tillsontitan) - I guess I didn't recognize the costume because I can only see your head. Great idea for Halloween! 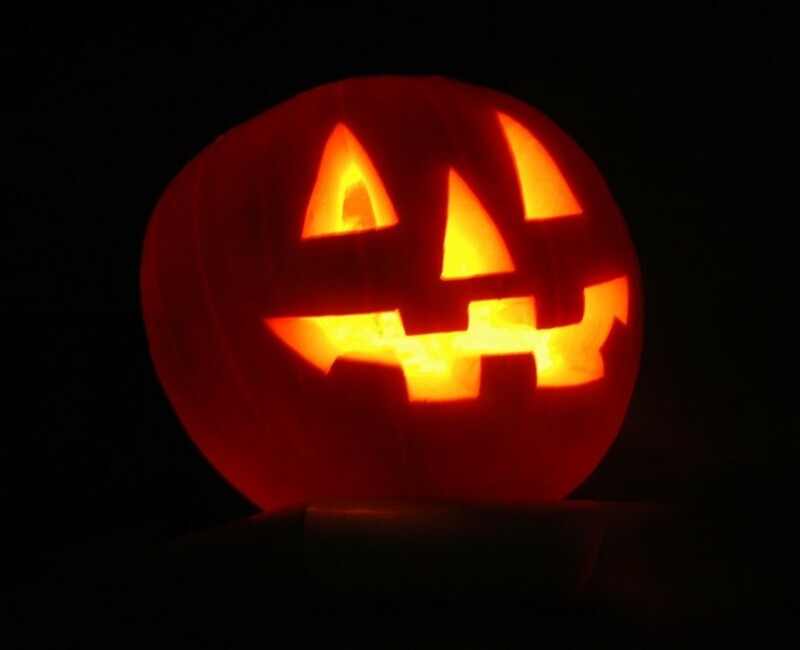 Great examples and pictures, just in time for Halloween! Hi Mary! 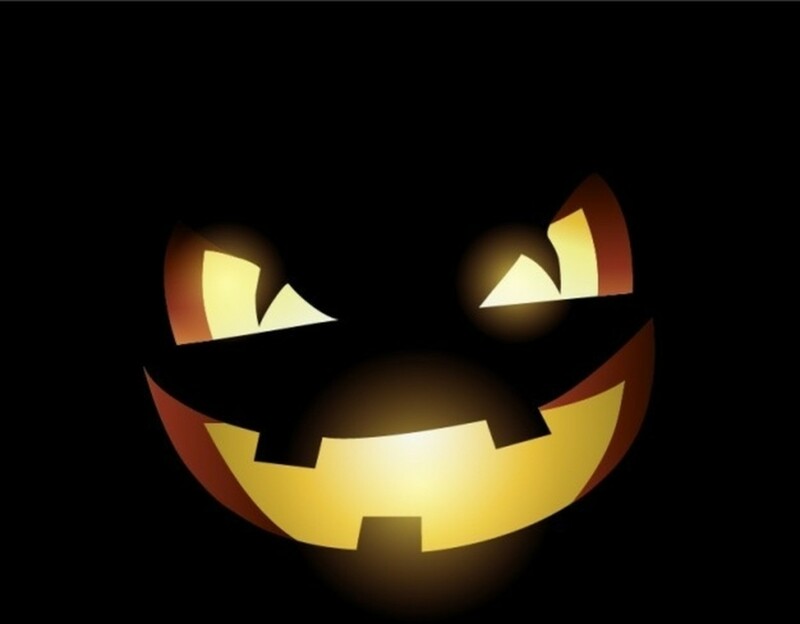 I miss your avatar in the Halloween costume. Maybe you'll change it back for a couple of weeks until the holiday. 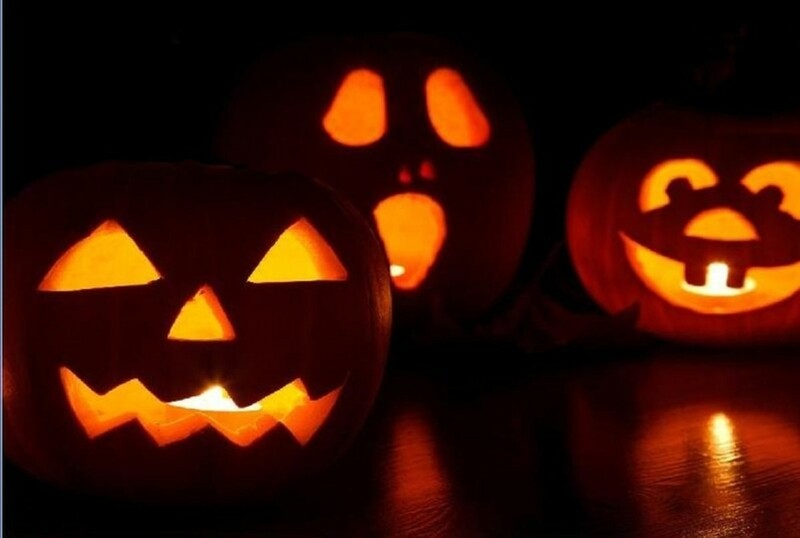 Carving the pumpkin is a great family activity. Thanks for the comment and the vote. 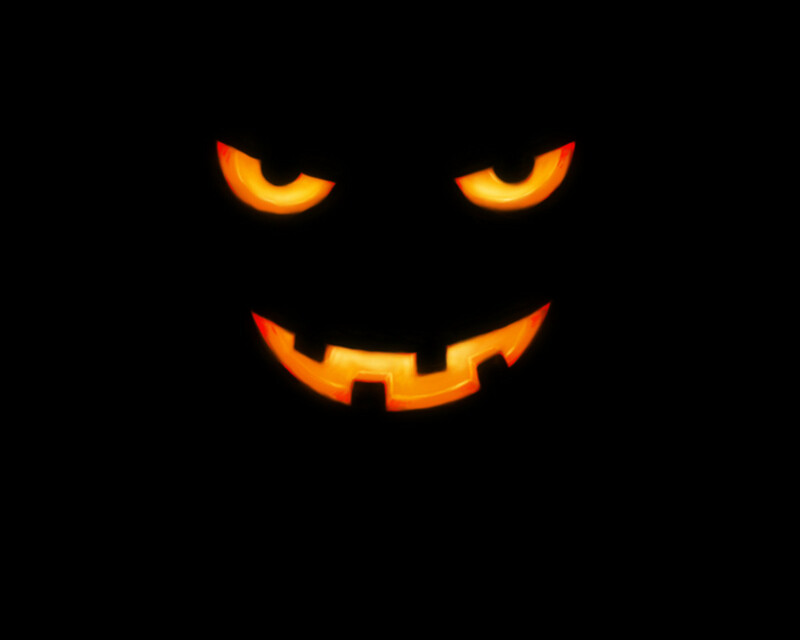 Halloween is the most fun holiday ever! 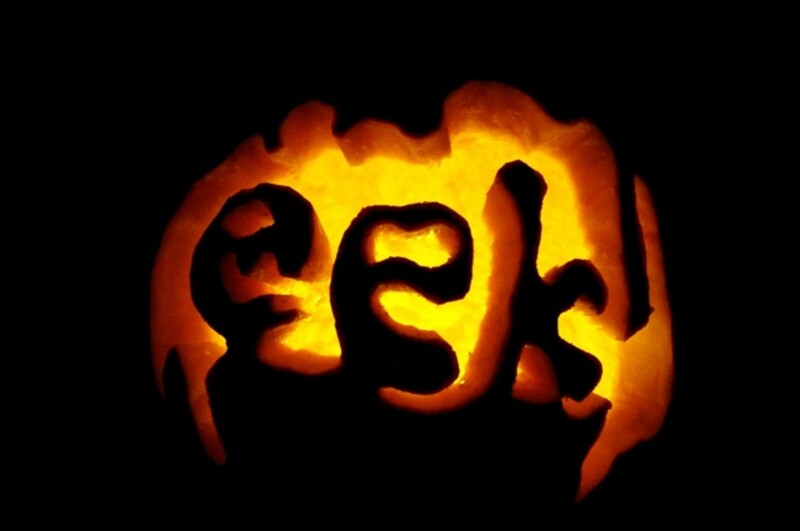 When my kids were young they couldn't wait for Daddy to come home and carve the pumpkin. They loved sticking their hands in the goo to clean it out and then baking the pumpkin seeds. 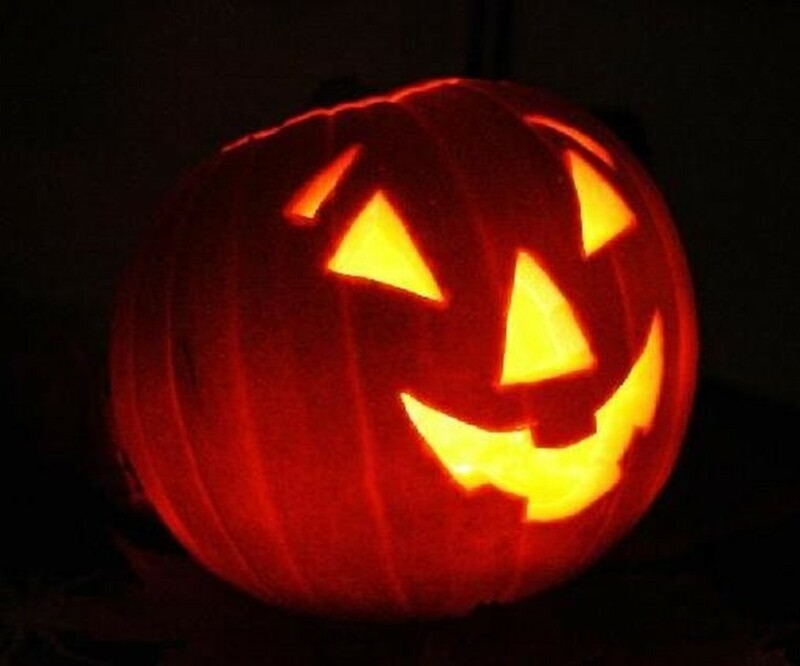 You've brought back many happy memories with your great pumpkin pictures and carving ideas! Thank you Frank. There's enough here to keep the whole family busy getting ready for the holiday. Hi Flourish: I love the autumn season, too, and pumpkins are a big part of that. Did you know that in Hawaii they often carve pineapples instead of pumpkins? 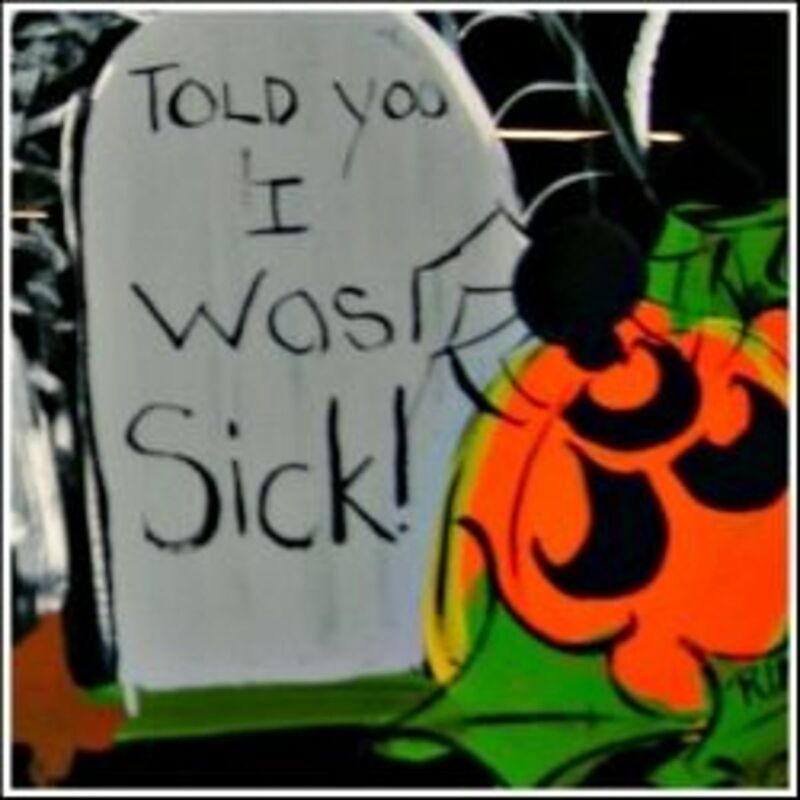 (I put a picture of one of those on my Pinterest Halloween page!) Thanks for the vote and for pinning. I appreciate that. Hi Merrci: No I didn't carve all of these myself. But, like you, it's great to have a lot of designs to look at for inspiration. I hope you found a few to use on your own pumpkins this year. Thanks for commenting. This is just amazing! Did you do all of those yourself? It made me realize how visual we are--I loved looking at every one of the designs. So clever, and so clear what the goal was, from Felix to happy to wicked. Brilliant! My favorite time of year! We usually have 3 or 4. Voted up +++ and pinning! 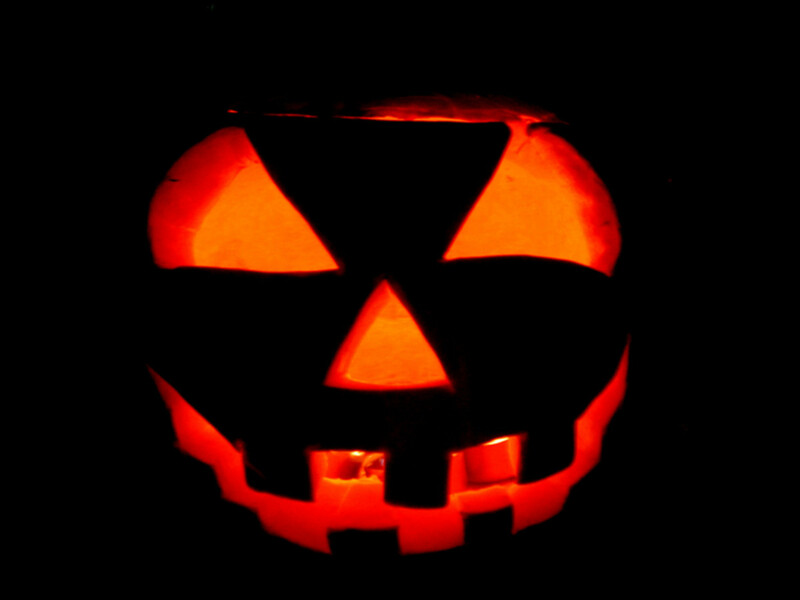 Hi Bobbi: Funny pumpkins are great, too, and the way the holiday is celebrated now it is just a fun time. Hi Linda: If you watch the video, there's an easy way to clean out the inside of the pumpkin. One way is with an ice cream scoop and another way is with a power tool. 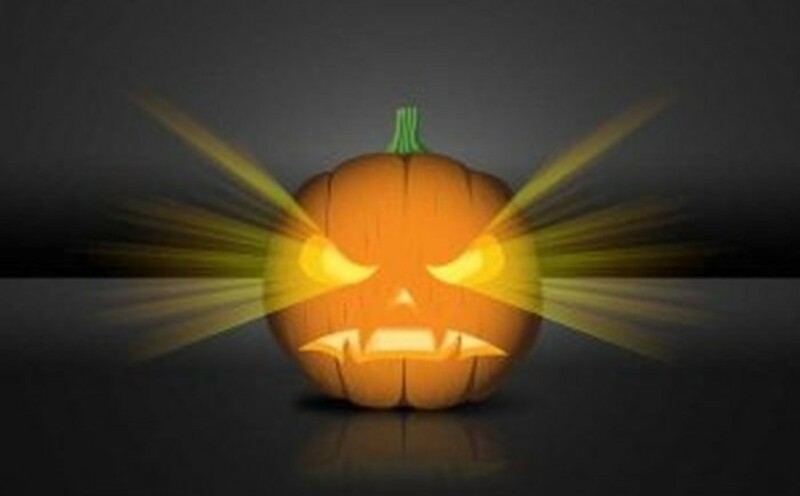 This is an amazing Jack-O' Lantern Tutorial Hub and I know parents and children alike will appreciate it. I wish I had this knowledge when my nephews were young. 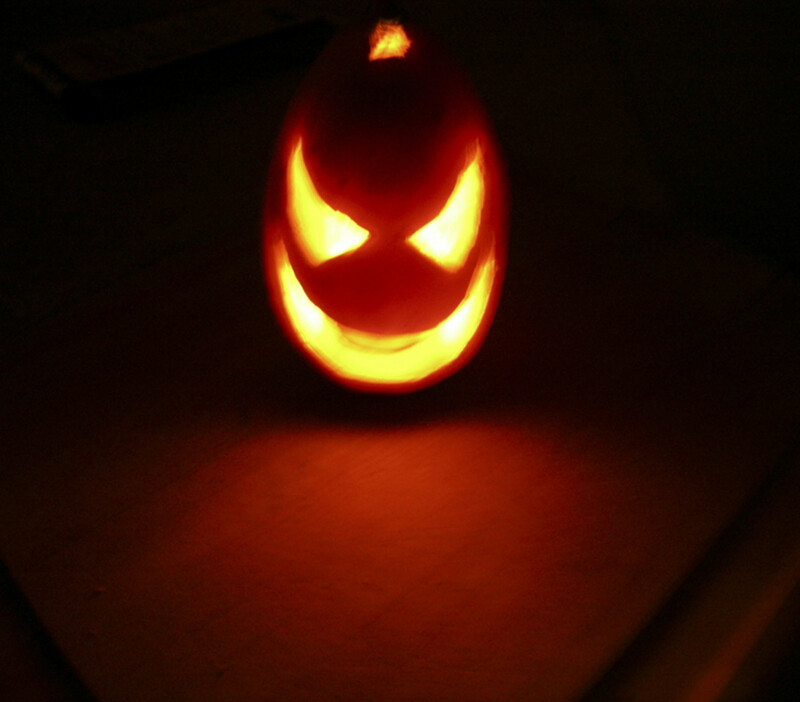 My attempt at carving pumpkins turn out more funny than scary. Another great hub and have a wonderful Friday. Some good ideas, but I what I want to know is: Who is going to clean out the pumpkin? Not Me! !